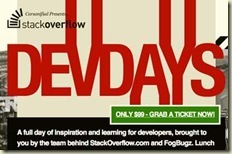 Stack Overflow DevDays in Washington D.C. on October 26th. The event is SOLD OUT with talks on Python, ASP.NET MVC, iPhone development, Google App engine, and jQuery. Something to learn for everyone! Øredev! I’m looking forward to seeing Sweden again! There are 14 tracks covering everything from Java to .NET, and Agile Ways to Leadership. The list of great speakers include, but are in no way limited to, Douglas Crockford, Jim Coplien, Dan North, Neal Ford, Ola Bini, Tess “Debug Diag” Fernandez, Shawn Wildermuth, Julie Lerman, Stephen Bowlen, Amanda “F#” Laucher, and Bea “WPF” Stollnitz. There is also Bellware, Oren, Hanselman, and Mr. Neward. It’s going to be awesome. EPiServer Meetup! I’ve been invited to fly into Stockholm while I am in Sweden to visit the awesome team at Nansen and talk at the EPiServer Meetup on November 4th. Watch the meetup page for more details. DevConnections! I’m in the ASP.NET track and have a post-conference AJAX workshop on Friday with lots of tips and tricks. Looking forward to seeing guys like Rick Strahl, Markus Egger, Paul Litwin, and Miguel Castro again. Exciting! Code Camp! The Central Pennsylvania .NET Users Group is having a Code Camp on December 5th. I hope to see you there! LINQ! I’m giving a three day class on LINQ and LINQ related technologies in Waltham, MA on December 8th. If you want to take a deep dive into the technology and see how LINQ and functional programming can transform not only your data access code but your business logic and tests, then sigh-up now. I’m sure we’ll go off on some interesting tangents, too.